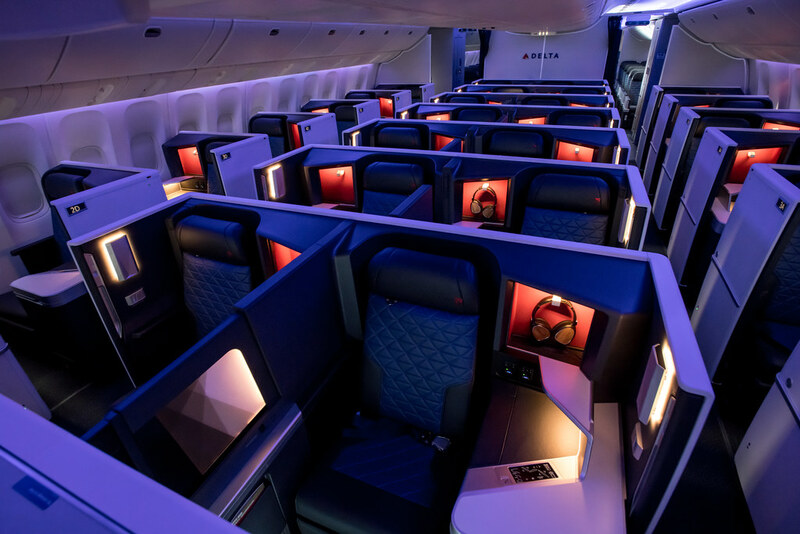 Delta has rolled out the first Boeing 777-200ER aircraft retrofitted with its newest business class product, the enclosed Delta One suites, and its new Delta Premium Select cabin, with the aircraft debuting on the carrier’s Detroit (DTW)-Beijing (PEK) route yesterday. The rollout marks the first aircraft in Delta’s plan to retrofit its eight B777-200ER and 10 B777-200LR aircraft with the new cabin products by the end of next year. So what does the refreshed aircraft look like? For starters, the B777-200ER now has 296 seats in total, with 28 Delta One suites (business class), 48 seats in Delta Premium Select (premium economy) and 220 Main Cabin (economy) seats. The Delta One suites, which debuted last year, notably feature a sliding door, providing an enclosed environment for business class passengers. Beds also recline to a fully flat position. In premium economy, passengers get the new Delta Premium Select seats, which offer 38 inches of pitch along with a 13.3-inch seat-back screen. The Main Cabin, meanwhile, is notable for maintaining a nine-abreast layout as opposed to the less spacious 10-across configuration that has increasingly become the industry standard for the B777. Hong Kong’s flag carrier, Cathay Pacific, notably began making the shift to a 10-across layout on its B777s in April, and there is speculation Singapore Airlines – one of the few carriers still operating a nine-abreast economy class configuration – could adopt the configuration when it begins taking delivery of Boeing’s new B777X aircraft in 2021. Having one less seat per row means the seat products themselves can be wider, and at 18.5 inches the Main Cabin seats in Delta’s retrofitted B777-200ER are the widest in its international fleet. Passengers in all classes also get access to in-flight wifi, powered by Gogo Ku Wi-Fi, as well as free mobile messaging using iMessage, WhatsApp and Facebook Messenger. While Delta’s first retrofitted B777-200ER has debuted on the airline’s Detroit-Beijing route, the aircraft will not be operating the route for long. The aircraft will fly the route on alternating days throughout this month – filling in for the airline’s Airbus A350-900 aircraft – but won’t continue on the route beyond July. The good news is that the A350, which the airline launched in November last year, similarly has the airline’s newest cabin products, so passengers flying the route after this month won’t end up missing out. Delta has been making significant changes to its Asia-Pacific services in recent months, including the announcement of two new notable services – Seattle-Osaka and Minneapolis/St Paul-Seoul, the latter also set to be operated by the retrofitted B777-200ER. Unfortunately, this expansion has also come at a cost with the airline set to drop its flights between Seattle and Hong Kong this October – its only non-stop service to and from the Chinese city. In recent months, Delta has been positioning Seoul Incheon airport as a major hub in Asia-Pacific, buoyed by the recent launch of its joint-venture agreement with fellow Skyteam alliance carrier Korean Air.